‘The Gables’, 69 French Street, Hamilton, VIC probably designed by Architect Walter Butler. regarded during the last century as `one of the beauty spots of the colony’. 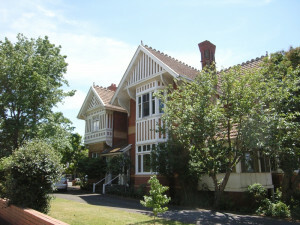 Eildon, now known as the Napier Club, was built as a two storey, red brick residence and surgery for Dr David Laidlaw in 1904 to a design by architects Ussher and Kemp in the Federation Queen Anne style. 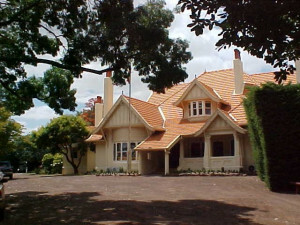 Myrniong, built in 1906-07 as a country residence for wealthy Melbourne businessman Leslie Jenner, consists of a large house, manager’s residence and stables. The main house, which is constructed of tuck pointed red brick, half timbering and rough cast, is dominated by a complex roof of asymmetrical composition, consisting of hips, gables, tower-like elements, dormers and tall chimneys. The grounds, inspired by the ‘gardenesque’ style of garden design, contain several remnant elements such as brick fences, brick and stone walls and a cast iron arbour. This area has regional significance because of its associations with the Hamilton Botanical Gardens, regarded during the last century as `one of the beauty spots of the colony’. This area became a prestigious residential area and was a focus for many prominent business and professional men who built fine residences there . 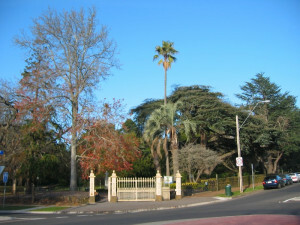 The Hamilton Botanic Gardens are one of the earliest regional botanic gardens in Victoria. Hamilton was first surveyed in 1850 with land set aside for a public garden in 1853, and was gazetted in 1870. The Hamilton Botanic Gardens, planned in 1850-51, first planted by William Ferguson in 1870 and then developed from 1881 according to a design of William Guilfoyle, have state significance as one of the most intact examples in Australia of a nineteenth century provincial botanic garden. It is an early example of Guilfoyle’s design, exemplifying his ideas about planting which were drawn form Edward La Trobe Bateman and were being actively implemented in his sweeping redevelopment of von Mueller’s design of Melbourne’s Botanic Gardens. Opposite the Hamilton Botanic Garden is this seriously large home, The Gables, with four reception rooms and five large bedrooms. 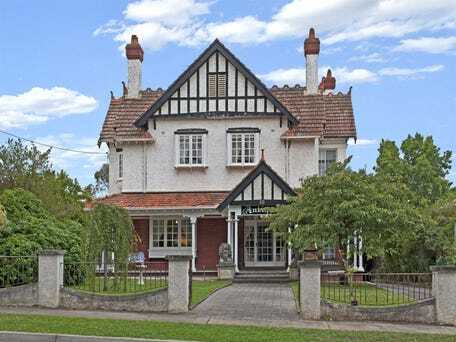 “Undoubtedly one of the Western District’s finest residences, “The Gables” is a stunning Queen Anne Federation two storey home (probably) designed by the esteemed architect Walter Butler for the Learmonth family in 1907. “Constructed of solid red brick and consisting of an expansive 75 squares, it is located opposite Hamilton’s world famous Botanical Gardens. Down the front path, wander past two massive hand carved granite lions and then into its beautiful and imposing entrance hall. From here you can enter into one of the home’s three stunning reception rooms or continue on into it’s impressive grand formal lounge and dining room which allow for large-scale entertaining. A closer look at the lounge area of the dining and living room. Another view of the reception room with bay window and ornate marble fireplace. The coffered wooden ceiling is typical of the ‘Arts and Crafts’ style, which exposes the support of the floor above. The spacious kitchen has a country style to it with more than enough room for a large dining table and is complete with a full sized butlers pantry. Downstairs also consists of an enormous bedroom with fire place, ensuite and dressing room, which are not illustrated here – all the downstairs rooms have timbered coffer ceilings, but none of these bedrooms have such a ceiling. The upstairs landing at 69 French Street, Hamilton, showing the entrance to the “green” bedroom. Off which you will find four more enormous bedrooms, two modern bathrooms (one with views out across the Grampians ranges) and a third and final reception room, which was originally a smoking room and still has the original tobacco nooks above the fire place. Click any thumbnail to view full size…. Since the architect Walter Butler was a Landscape Architect as well, the (large) garden is probably designed by him. Can you see the wisteria arbour, and the pool in the distance? SIGNIFICANCE: Notwithstanding the verandah, a very English version of the Federation style, the house was probably designed by Walter Butler. It has important associations with leading townsmen. It was probably designed by the leading society architect, Walter Butler. He was active in the area at this time and associated with the Learmonths. ([ii]) See the page on Architect Walter Butler. Notwithstanding the verandah, it is a very English version of the Federation style and hints at the Arts and Crafts movement in its detailing. This building has regional significance for its architectural interest as a fine example of the Queen Anne style house and for its historical associations with Harold Learmonth (1863-1933) of Peter Learmonth & Co., stock and station agents and auctioneers, a prominent Hamilton townsman and mayor. Learmonth’s brother-in-law, Dr David Laidlaw, Medical Superintendent at the Hamilton Hospital, built his mansion Eildon, around the corner at 34 Thompson Street, in 1904. [i] Garden, D, Hamilton, pp 120, 129, 130, 172, 173, 213. [ii] He designed Myrniong and extensions to Murndal in 1906. [iii] ADB, Vol 7, p 510-11 and Vol 9, p 562-63. [v] Ibid., 1888, No. 252 (wooden house, NAV 48 pounds), 1890, No. 232 (wooden house, NAV 48 pounds). [vi] Walter Butler was a landscape architect and, having designed an important garden at Myrniong, may have done so at The Gables. Gracefully extended, this turn-of-the-century “belle” has formal and casual living areas and up to five bedrooms, offering a superb floor plan that will adapt to suit a growing family. This Federation style is what Melbournians call “Edwardian”, meaning the walls are of timber. Queen Anne style uses red brick walls. 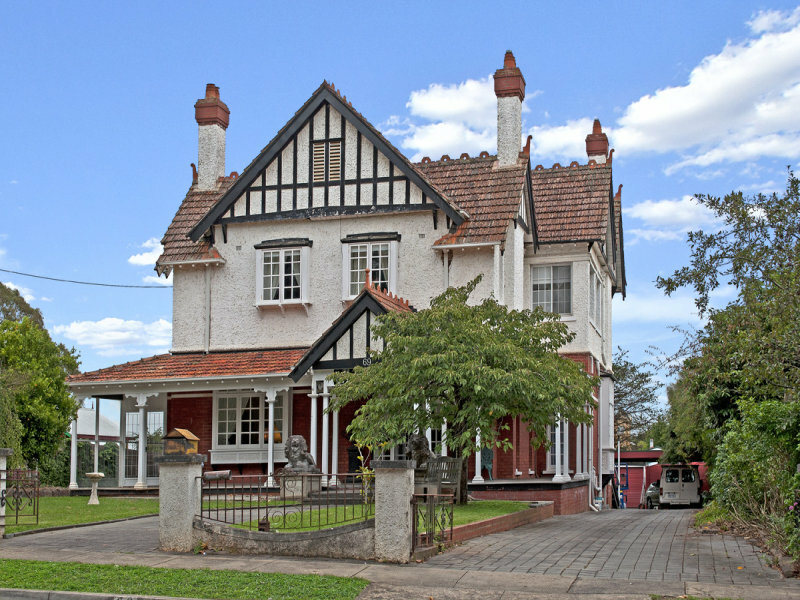 The Sunrise fretwork decoration in the front main gable symbolizes the ‘New era’ of Australian Federation (the separate colonies unite federally to form the new Australia (which is why this style is called ‘Federation;), and is a landmark feature of houses built in 1900-1903. Technically, because the verandah roof is continuous from the top ‘hip’ in the roof to the timber verandah posts, this is a a ‘very new’ Federation Bungalow style. Victorian period houses (prior to 1900) had a separate verandah roof, which is not a feature of Federation style. Upholding the local history is the cedar-lined garage, which was once stables – the original owners would walk their horses to the Moonee Valley racetrack. “Two ground-floor bedrooms (BIRs) are complemented by a fitted study/bedroom and an Edwardian-style bathroom with shower and clawfoot tub, and the Upper level has two further bedrooms (BIRs) plus a retreat with city glimpses, a bathroom and attic for storage”. Lounge room with marvellous bay window at 74 McPherson Street, Essendon VIC 3040. Note the ornate ceilings and cornice work, typical of the period. (Fortunately, the house will be sold without the unsympathetic lounge room suite. What beautiful Art Nouveau leadlight windows. A bay window of great beauty! A fretwork arch has obviously been replaced by bespoke timber shelving. Looking up you can see the pressed metal ceiling, usually made by Wunderlich. Updated Meile kitchen. Try to overlook the flooring: originally this flooring would be made of timber of much the same overall colour (see below). Entertainment room with a statement, shiny wooden flooring, which is hidden elsewhere in the house. The heritage of this bathroom has been retained, and looks splendid. The armoire (free standing cupboard) is a fine addition and is bespoke (made to order – check out the bespoke bedroom furniture of the same style). Yes, there is the bespoke pair of bedroom drawers to match the bathroom furniture. The rear garden and the sympathetic first floor extension. The floor plan clearly shows the sympathic extensions to the back of the house. The projecting rear bay window is a new feature, quite similar to the bay window at the front of the house. Perched on the highest point between (Melbourne) city and Sandringham, this turn of the century red brick manor is a true icon of Brighton Beach overlooking the most famous stretch of metropolitan Melbourne beachfront. Federation Queen Anne style features red brick construction, terracotta tiles or slate tiles, and white pained woodwork. Note the assymetric frontage, with a right hand side conical tower (‘candle-snuffer’) and a left-hand side cupola. The effect is picturesque. This 1468sqm estate enjoys sweeping seaside panoramas with views extending from Brighton’s famed bathing boxes to the glittering city lights, Macedon ranges and beyond. Brighton seaside, with Swanview on the left. A consummate example of Federation Queen Anne architecture, the estate comprises a main house and outbuildings (6 bedrooms & 3 bathrooms) that include a self contained residence, double carport and workshop. The impressive main house features a grand dining room, drawing room fitted with bar and library cabinetry, and a turreted lounge. An open plan granite kitchen with Falcon range, lounge/ playroom and first floor children’s quarters make it ideal for a growing family. The ground floor master (with ensuite access to a stylish bathroom with freestanding bath), provides parents with privacy, even as they sleep close by. Rich with period detail, this grand home is the pinnacle of elegance. Soaring 14′ ceilings and Federation style fretwork are complemented by marble and mahogany fireplace mantles. Main bedroom at 82 Esplanade, Brighton. Numerous bay windows and an entertaining veranda capture breathtaking views of the sea and overlook landscaped lawns and garden below. A high gabled roof line featuring decorative turrets and imported French terracotta tiles, tops it all off in grand style. Detail of roof fineal styled as a dragon’s head. With just four owners over its 116 year history, this is truly a once in a lifetime opportunity to secure one of Melbourne’s most iconic properties. Virtual tour of the seaside area (drone’s eye view only), revealing a two-storey Queen Anne home toward the city on the Esplanade. Seriously, the drone doesn’t even fly through the house so the identification of this video as a ‘virtual tour’ is inadequate and misleading.